BOOMSTICK ACCESSORIES proudly brings you our 9” CABLE GUN CHAMBER LOCK. These locks are all KEYED ALIKE, which means you can use one convenient key for your entire collection. Safely lock-down almost any of your rifles, handguns, pistols, or shotguns with one of the best gun locks for child safety! And with heavy-duty vinyl coating on all components, you don’t need to worry about scratching your firearms. Enjoy total safety and order your locks today! 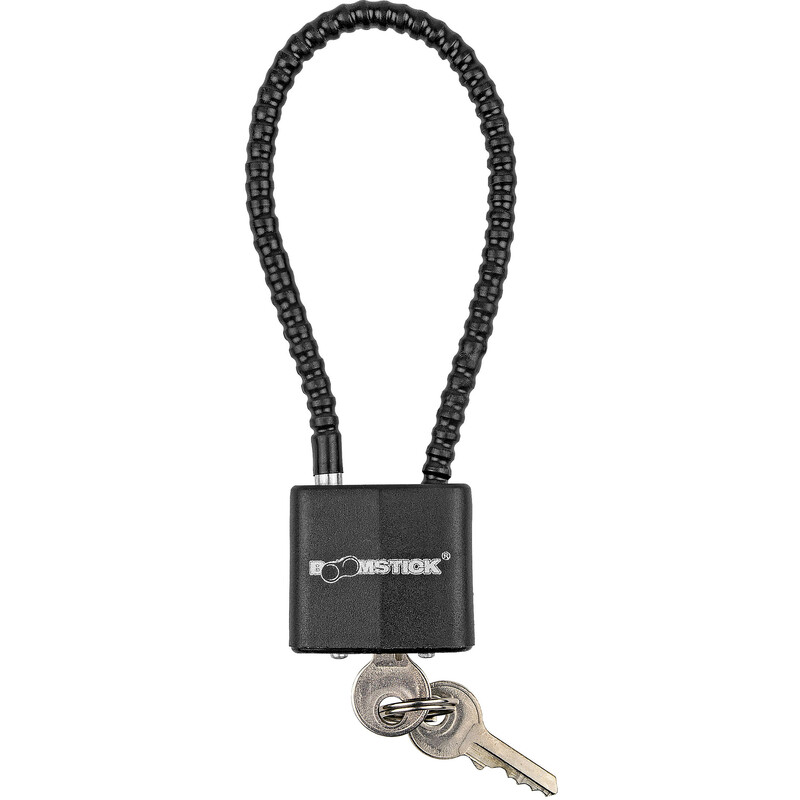 This Boomstick Gun Accessories gun lock is your first line of defense when safely storing your gun. It has a cable length of 9" to fit most handguns, shotguns, or rifles. Cable and lock are vinyl coated to prevent scratching and two keys are included with each lock! Ensure TOTAL firearm safety and make your Mother proud, with BOOMSTICK ACCESSORIES line of FIREARM CABLE LOCKS! This 9” model gives you far-more versatility than a simple trigger lock, and comes fully coated in durable vinyl to make sure even your collector guns remain unscratched and securely on lock-down at all times! Simply slide the 9” cable through the chamber, and lock. Now your set! That’s all it takes to get the best lock for child gun safety. Our locks are the easy and versatile solution that prevents rounds from being chambered, actions from engaging, cylinders from moving, and magazines from loading. In one simple lock. These locks our KEYED ALIKE which means that you can have one convenient key for all your locks, on all your firearms! So order a whole set for entire collection, and take care of it easily! And since BOOMSTICK ACCESSORIES is designed, manufactured, and sold with the GUN OWNER’S NEEDS FIRST, you can rely on us for a solid solution when your searching for the best gun locks for all kinds of guns. At 9” long, this lock fits almost any handgun, pistol, shotgun or rifle, quickly and easily. We’ve included two keys for each lock, giving you the ability to stash one key and also keep one with you at all times. That’s just one more way you can get a higher level of security for your cabinet. Enjoy the simple solution you’ve been looking for in a gun lock, and order yours today! Make your Mother Proud!